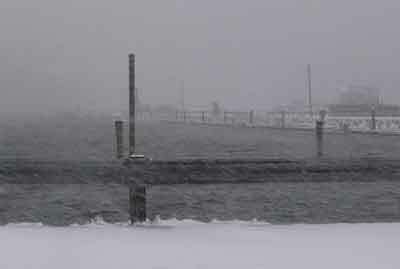 Is it just me or are you at a point in life where you enjoy snow more from the inside looking out than being out in it? I think the many years I spent in Upstate New York and New England digging out my driveway and being caught ‘under dressed’ in the interest of fashion over practicality have tainted my enjoyment of snow. With that being said and this being the view outside at the moment you can bet I’m dreaming of warmer weather, sunny skies and a colorful garden rather than snow in the backyard. 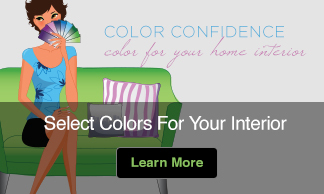 So here I sit bundled up inside scanning sites like Proven Winners looking for the colors of my dreamy summer garden. The color red-violet has been on my mind this week after being interviewed for an article titled, “Did Purple Send a Message at the State of the Union Address?” (hint–it was really red-violet not purple as I wrote about in my post on Live in Full Color) so I guess it shouldn’t be a surprise that flowers in this color seemed to call out to me? 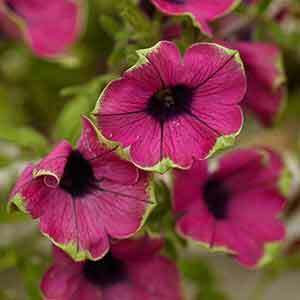 I bet you’ve never seen a petunia like this before. This is a new addition from the Proven Winner line. 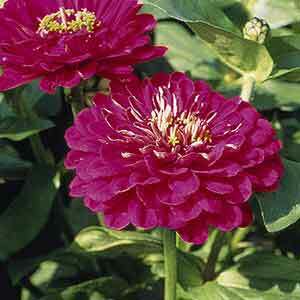 I love the bright shade of lime green that rings the pretty red-violet flowers. This is at the top of my list for plant purchases and best of all it produces flowers all summer long. To bring out the green in the flowers even more I think I’ll find a pretty plant with bright yellow-green foliage and put these in all the hanging baskets that surround my deck. This zinnia stood out and caught my attention. Benary’s Giants Wine zinnia has huge, fully double deep red-violet flowers atop strong stems, which will make them perfect for cutting. Paired with flowers in deep gold and dark green foliage this flower will really stand out along the border of my garden and cut flower arrangements. While the masses of blossoms are more of a shockingly hot pink I think they will marry nicely with the flowers that are a bit more red-violet. Besides they bloom all summer long even it the hottest weather and I can bring a pot or two into my office to enjoy long after the summer ends. The bold hot pink color will be a nice contrast against a rich, deep foliage such as Blackie or Illusion Midnight Lace sweet potato vine that has undertones of violet. If you’ve been reading my Pink Saturday post you know that lantana graces my garden just about every year. What I like about the Bandito series of lantana is the compact size of its blossoms and that is produce an extra large number of blooms. There is also a richness to the blossoms of this variety that make is especially appealing to me. To soften this bold lantana I might incorporate some white flowers such as white calibrachoa or Diamond Frost euphorbia. Not only does this plant produce gorgeous flowers but it also has lemon-scented foliage and is easy to grow. That’s the kind of three-in-one benefit package I like. 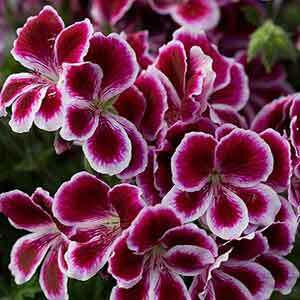 The deep red-violet set off with white edges will be a nice counterpoint to the brighter flowers above. This is another blossom that would pair nicely with an airy variety like white guara or Breathless Blush euphorbia. 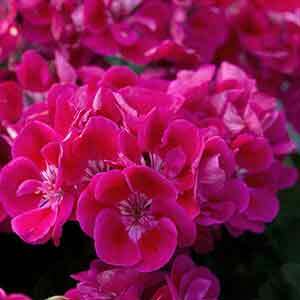 Both will soften the texture of the geranium. Now this is just the beginning of my summer dream and the snow is falling fast and furious so I’m going to go make a cup of tea and get back to browsing flower sites and Pink Saturday posts. I hope I’ve left you feeling a bit more ‘in the pink’ on this very white Saturday. My spirits have sure been lifted just looking at all these beautiful blossoms! Love the pink flowers, this is a great site, I love color and will be following your posts. 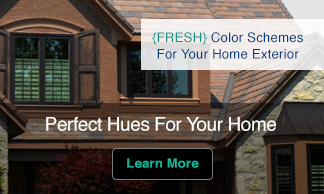 You’ll have such a beautiful garden with these colors! 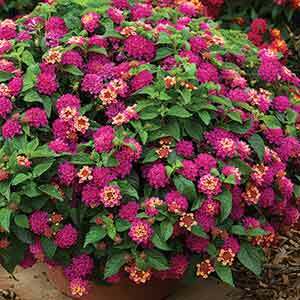 I’m thinking about planting lantana this year also! so you have put spring in my heart! Those deep pinks are absolutely stunning and yes, I am sure a very welcome site in comparison to what life has literally decided to drop into your backyard today. The Pacific Northwest is seeing warmer that usual temperatures this season and no snow so far, not even ice which is really usual but I’m loving it.